There are 36 Assisted Living Facilities in the Frankenmuth area, with 3 in Frankenmuth and 33 nearby. The average cost of assisted living in Frankenmuth is $3,230 per month. This is lower than the national median of $3,346. Cheaper nearby regions include Saginaw with an average starting cost of $2,885. To help you with your search, browse the 127 reviews below for assisted living facilities in Frankenmuth. On average, consumers rate assisted living in Frankenmuth 4.5 out of 5 stars. Better rated regions include Flushing with an average rating of 4.9 out of 5 stars. Caring.com has helped thousands of families find high-quality senior care. To speak with one of our Family Advisors about assisted living options and costs in Frankenmuth, call (855) 863-8283. Located a short 17 miles from Saginaw, Frankenmuth, Michigan is known as “Little Bavaria” thanks to the unique German architecture found around the city. Seniors can explore this heritage further in cultural activities around town. The city boasts three assisted living facilities, and there are also 34 nearby, particularly in Saginaw. These all help seniors to retain some independence while providing help with basic needs. 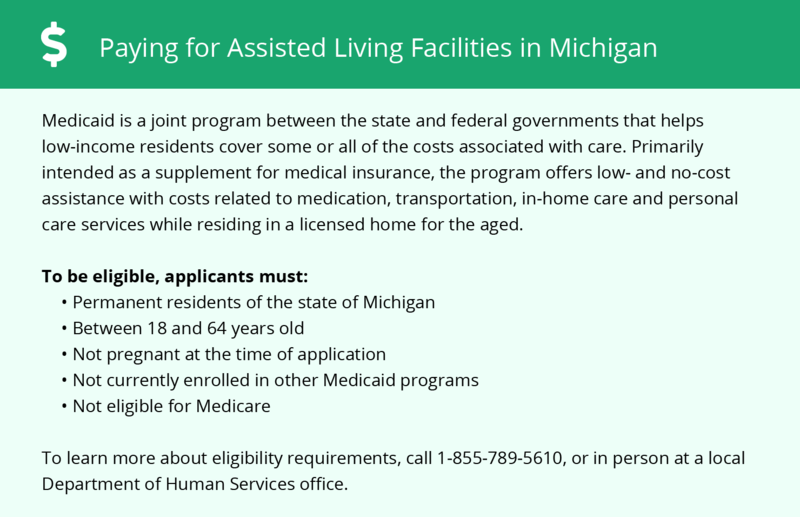 With few exceptions, assisted living facilities in Michigan aren’t licensed by any government agency. Frankenmuth gets an average of 38 inches of snow per year. The winters are frigid with lows in January going down to an average of 15 degrees. The summers are nice with average highs in July reaching about 82 degrees. The city has fewer sunny days per year than the national average. It sees about 174 sunny days, while the national average is 205 days. Seniors who have respiratory difficulties might find some relief in Frankenmuth. The air quality is much better here with a score of 81. This is a nice increase from the national average of 58. The cost of living in Frankenmuth is 95.2, which is lower than the national index of 100. Unfortunately, the health index is 105, which is slightly higher than the national index. The grocery index is 94.7, which is a tad lower than the national index. A huge benefit to living in Frankenmuth is that the crime rate is lower than the national average. The average for property crime in the country is 38.1, but Frankenmuth’s is only 29.5. Violent crime is also much lower with Frankenmuth’s rate at 10, while the national rate is 31.1. The art and culture scene in Frankenmuth is eclectic. Many Bavarian traditions are highlighted during Friday Fun Nights. Festivals are held throughout the year. Craft shows, live music, and races might also provide seniors with fun options for spending time with family members and friends. The Frankenmuth has no/few facilities from which to choose in the event of a medical emergency or illness, with the nearest major hospital located in Saginaw. Assisted Living costs in Frankenmuth start around $3,230 per month on average, while the nationwide average cost of assisted living is $4,000 per month, according to the latest figures from Genworth’s Cost of Care Survey. It’s important to note that assisted living rates in Frankenmuth and the surrounding suburbs can vary widely based on factors such as location, the level of care needed, apartment size and the types of amenities offered at each community. 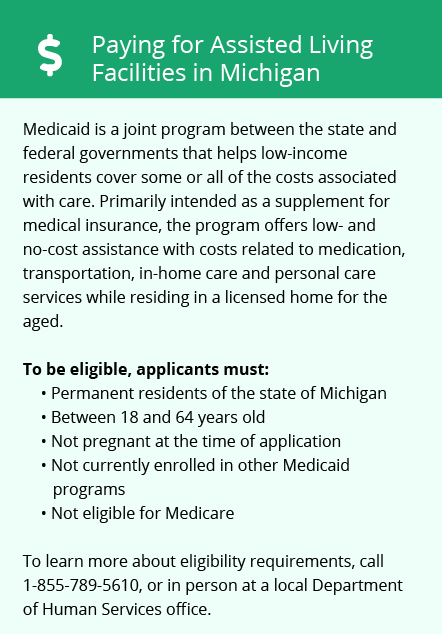 The MI Choice Waiver Program can help some Frankenmuth senior citizens to pay for certain costs associated with assisted living, including preventative nursing, non-medical transportation services and chore services. Frankenmuth and the surrounding area are home to numerous government agencies and non-profit organizations offering help for seniors searching for or currently residing in an assisted living community. These organizations can also provide assistance in a number of other eldercare services such as geriatric care management, elder law advice, estate planning, finding home care and health and wellness programs. To see a list of free assisted living resources in Frankenmuth, please visit our Assisted Living in Michigan page. Frankenmuth-area assisted living communities must adhere to the comprehensive set of state laws and regulations that all assisted living communities in Michigan are required to follow. Visit our Assisted Living in Michigan page for more information about these laws.